Here’s a healthier oven-baked recipe that your family will love to turn to when they need a quick meal. Nothing beats the real thing. Am I right? Taking advantage of grocery store’s sale on chicken is a great way to make homemade versions of your favorite chicken meals. One meal that my family loves is chicken nuggets. 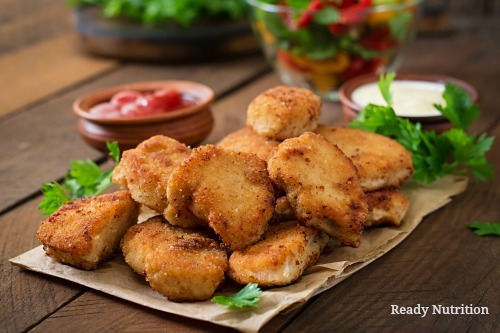 These nuggets are made from fresh quality ingredients like chicken breasts, bread crumbs and seasonings, not pink slime. Here’s a healthier oven-baked recipe that your family will love to turn to when they need a quick meal. In a medium bowl, mix together the bread crumbs, cheese and seasonings and set aside. In a small bowl, add egg and turn with fork until mixed well. Cut chicken breasts into 1-2-inch sized pieces. Dip chicken pieces into the egg, then coat with the seasoned breadcrumb mixture. Place chicken pieces on a lightly greased cookie sheet in a single layer. I will also spritz some olive oil on top of chicken nuggets to help them crisp up in the oven.